WordCamp events are a unique way for anyone involved with WordPress to meet the community, get inspired but also learn something new. As the WordPress community grows and changes, so does the concept of WordCamps. It is not uncommon for organizers to try new and different approaches for the activities that happen during the event. Lately, one very prominent example of this is the workshop format which usually happens on a separate, pre-conference day. I was lucky to be able to attend quite some WordCamps so far and even more fortunate to be able to speak at a nice number of those. It goes without saying how much I enjoy every single WordCamp I get the chance to experience. However, WordPress community started to realize that most of the attendees want more chances to learn something specific, something concrete. And while the WordCamp talks are well curated and awesome, they are usually simply too short to teach you anything practical. This is where I think workshops can play an important role. Depending on the format, they can last for two, three hours spent behind a computer, doing something real and learning first-hand. The last WordCamp I attended was the one in Zagreb, Croatia, at the start of September. For the Croatian WordPress community, it marked a new pinnacle on virtually all levels, from attendance to organization. After hearing that around 15% of all ticket sales happened because people were primarily interested in the announced workshops, I decided to reach out to the organizers and ask them a bit more about this. 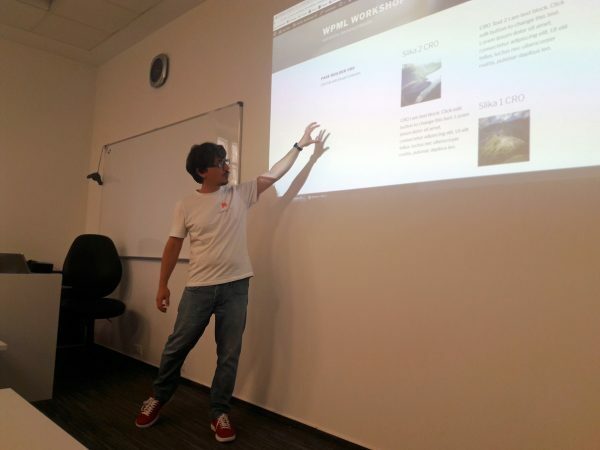 I had a pleasure to talk to my friend Emanuel Blagonic, one of the most prominent people in Croatian community, a guy who is extremely involved with it from the very beginnings and naturally one of the lead organizers of WordCamps in Croatia. He also attends many WordCamps around Europe and there is a good chance you saw or met him at one of these. Dario: Hi Emanuel, thanks a lot for this opportunity! First, congratulations on a great WordCamp Zagreb that happened in September! Since we are talking about workshops, could you please share some numbers with us? I know that the number of WordCamp attendees in Croatia is on a constant rise. Is it the same with the workshops? Emanuel: Talking about WordCamp numbers, we had 22 talks on the main conference days, divided into two tracks – inspirational and advanced. Around 300 people attended the conference day which is a big number, considering past WordCamps. We were thrilled with the numbers and especially with the advanced track which proved a giant success. As for the workshops, we had 12 workshops, of which three were planned for kids only. There were 140 workshop registrations and we were more than happy with it since we published workshops quite late in the schedule and this is the biggest number of registrations we ever had. More than 100 people attended the workshops and the reason we don’t have exact numbers is because we let more people in when we had room to do it. Unfortunately, one workshop was sold out for everyone that didn’t have a ticket for WordCamp Zagreb (and also some of those who had). Dario: What are the challenges that you as organizers run into while organizing workshops on WordCamps? Emanuel: The biggest challenge is how to sell those. Although we use workshops as a selling point for our WordCamps, organizing a good workshop is not always easy but luckily for us – we had amazing speakers, experienced in their field, so people were eager to be there. Other significant challenge is how to give people extra value, and to do that you need to prepare a good schedule. Workshops were grouped by topic: kids, business, development and personal growth. This way you could choose a topic that interests you and we also tried to group them so you could, for example, go to a “How to work with WordPress” workshop in the morning, and then based on your interest continue with the one about managing big news portals, to one about strategic storytelling, to one about multilanguage. The trick is in a good schedule that leaves people room to mingle based on their interest. Dario: How important do you feel workshops are for a WordCamp? Do you think people can actually learn something or is it more of an opportunity to get them started and take it from there? Emanuel: Very important. In a way, they can help boost ticket sales, and we anticipated some 50 ticket sales after publishing workshops schedule (which happened). Also, workshops are a perfect way to interest general audience about WordPress and its ecosystem of developers, designers, marketers. Dario: Could you share any thoughts from the workshop attendees? What is the general feedback coming from them? Here are some comments from the attendees of the WordCamp Zagreb workshops. I think Emanuel’s answers and the quotes from the attendees themselves sum up the importance and beauty of workshops as a part of a WordCamp experience. WordCamps are fantastic events for anyone attending and adding meaningful, well-organized workshops to them brings them a whole new level of usefulness, even for people that are entirely new to WordPress.